Forgive me, dear readers, for this encore appearance of this dish that I was yapping about in a previous post, but I just had to post a photo and recipe of it, to do this delightful salad justice! There are some foods I don’t mind eating over again and again… fluffy steamed white rice, cheeseburgers, eggs in any form, inari sushi… and more recently, this Asian (or really, Malaysian) salad that WS introduced me to. He remembered eating this back home in Malaysia and thought it would be the perfect cooling complement to a chicken curry we had cooked last week. Your 5-a-day all on one plate! It’s crunchy and slurpy, sweet and savoury, spicy and sour, flavourful and crisp all at the same time. 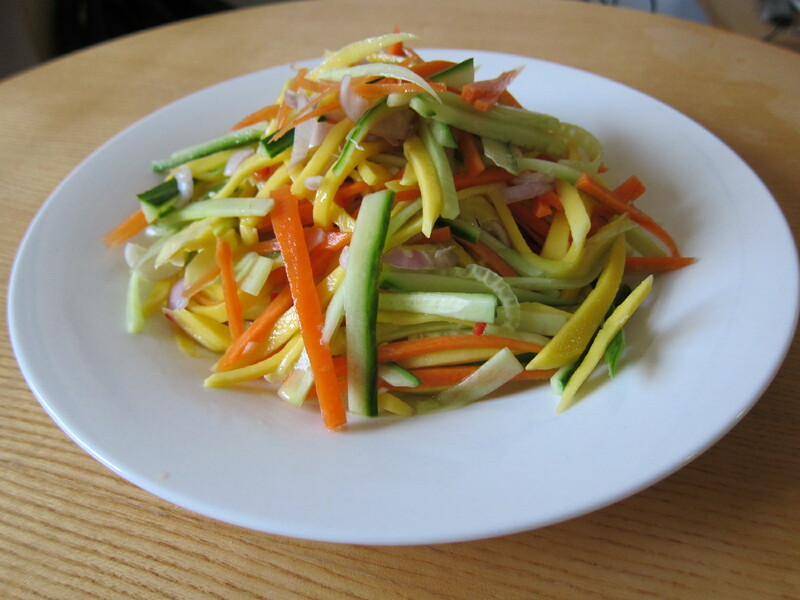 Mango Kerabu is very similar to Thai Papaya Salad, but it just makes use of greener mangoes instead. Personally I love it with ripe mango because it makes the salad even sweeter! And one added bonus to this dish is that when preparing it, all of the fragrances of lime, cucumber and mango will eventually infuse into your kitchen, creating a really lovely, natural air freshener. I had no idea lime could smell so good. It almost makes me want to get lime-scented perfume! Right, so here’s my version of the the salad :). Hope you give this a try – and do let me know how it goes, what you think! – 1 small red chilli, chopped finely and de-seeded if spicy just isn’t your thing! – white sugar, 1 teaspoon or just to taste. Some people prefer a tarter dressing; for me, it’s important to balance the sweet with the sour so I would definitely add 1 teaspoon. 1. Julienne all of the vegetables and chop the shallots and chilli. Mix in a large bowl. 2. Mix ingredients for the dressing. 3. Plate veggies and drizzle dressing over the mix. Garnish with coriander.